These handy baskets can be used to store any number of household items. Great for the kitchen, bathroom, bedroom, and even the utility closet, these cute crochet baskets are easy to make and great for helping you keep your life organized. 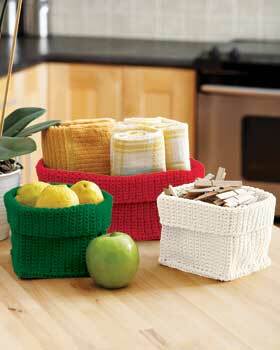 These crocheted baskets would also be an adorable way to present baked goods as a gift. Start now to have a bunch ready for the holiday season. Gauge: 18 sc and 20 rows = 4 ins 10 cm. Small: Approx 5 x 5 x 6 ins 12.5 x 12.5 x 15 cm, with top unfolded. Medium: Approx 5 x 10 x 6 ins 12.5 x 25.5 x 15 cm, with top unfolded. 1st row: (RS). 1 sc in 2nd ch from hook. 1 sc in each ch to end of ch. Turn. 27 sc. Rep last row until work from beg measures 5 ins [12.5 cm], ending with a WS row. **Next row: (RS). (Fold line). Ch 1. Working through back loops only, 1 sc in each sc across. Turn. Next row: Ch 1. Working through both loops, 1 sc in each sc across. Turn. Next row: (RS). (Joining row). Place foundation ch behind last row with WS of work tog. Ch 1. Working through both thicknesses, 1 sc in each sc across. Fasten off. Next row: (RS). (Fold line). Ch 1. Working through back loops only, 1 sc in each sc across. Turn. ***Next row: Ch 1. Working through both loops, 1 sc in each sc across. Turn. Rep last row until work from last fold line measures 5 ins [12.5 cm], ending with a WS row. Rep from *** to *** once more. Place foundation ch behind last row. Working through both thicknesses, 1 sc in each sc across. Fasten off. 1st row: (RS). 1 sc in 2nd ch from hook. 1 sc in each ch to end of ch. Turn. 22 (45) sc. Rep last row until work from beg measures 5 ins [12.5 cm], ending with a WS row. Do not fasten off. Next rnd: (RS). Ch 1. Working through both thicknesses, work 1 rnd of sc around all 4 sides of Base. Join with sl st in first sc. Fasten off. Apply fabric stiffener to Baskets following manufacturer’s directions. Fold top edge to RS as shown in picture.